Gangadharan, V. et al. (2015) Am. J. Physiol. 308, C41. Activation of P2X7 receptor is important for the synthesis of new bone. Caveolin-1, the main component of caveolae was shown to regulate P2X7 signaling. In order to show the localization of P2X7 in caveolae, MC3T3-E1, murine preosteoblast-like cells underwent immunocytochemical staining with labeled cholera toxin and Anti-P2X7 Receptor (extracellular)-FITC Antibody (#APR-008-F). The ganglioside GM1, the receptor for cholera toxin has been shown to be concentrated in caveolae. Staining showed that P2X7 receptor colocalizes with cholera toxin (Figure 1). Overall, activation of P2X7 receptor induces CAV1 endocytosis in osteoblasts leading to a decrease in P2X7 signaling. Figure 1. Immuno-colocalization of P2X7receptor and cholera toxin in MC3T3-E1 cells.Immunocytochemical staining with labeled cholera toxin and Anti-P2X7 Receptor (extracellular)-FITC Antibody (#APR-008-F). The ganglioside GM1, the receptor for cholera toxin is concentrated in caveolae. Staining shows that P2X7 receptor colocalizes with cholera toxin.Adapted from Gangadharan, V. et al. (2015) with permission of the American Physiological Society. Kwon, O.S. et al. (2015) J. Appl. Physiol. 119, 1033. Mechanical ventilation is used under conditions of respiratory failure, coma, heart failure and surgery. However, prolonged mechanical ventilation leads to diaphragm weakness generally termed ventilator-induced diaphragm dysfunction (VIDD). There is a direct correlation between VIDD and increased ROS (reactive oxygen species) production. In this case, ROS production is caused by increased Angiotensin II (Ang II) levels in the plasma. Angiotensin II Receptor Type 1 expression was demonstrated by immunohistochemical staining of rat diaphragm sections using Anti-Angiotensin II Receptor Type-1 (extracellular)-ATTO-550 Antibody (#AAR-011-AO), (Figure 1). Furthermore, inhibiting the receptor with an FDA-approved AT1R inhibitor protected against VIDD. Figure 1. 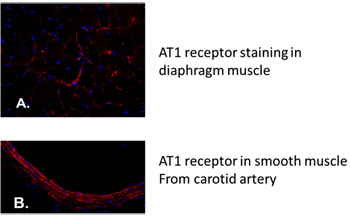 Expression of AT1R in rat diaphragm and smooth muscle carotid artery sections.Immunohistochemical staining of rat diaphragm muscle (A) and rat smooth muscle carotid artery (B) sections using Anti-Angiotensin II Receptor Type-1 (extracellular)-ATTO-550 Antibody (#AAR-011-AO). DAPI is used as the counterstain.Adapted from Kwon, O.S. et al. (2015) with permission of the American Physiological Society. Ono, K. et al. (2015) J. Neurophysiol. 113, 3345. Painful heat perception is mostly attributed to TRPV1. The genetic aspects of TRPV1 and thermal nociception were investigated in two different inbred mouse strains: C57BL/6 and BALB/c. 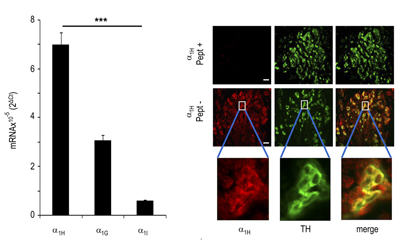 Immunohistochemical staining of mouse trigeminal (TG) sections using Anti-TRPV1 (VR1) Antibody (#ACC-030) showed that TRPV1 expression was significantly higher in IB4-positive TG neurons of C57BL/6 strain (Figure 1). Consequently, C57BL/6 mouse strain is more sensitive to thermal nociception. 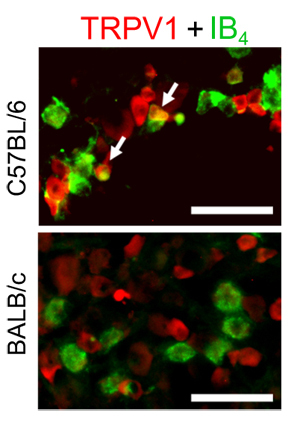 These results suggest that the differential expression of TRPV1 in IB4-positive TG neurons of C57BL/6 and BALB/c mouse strains contributes to the differences in thermal nociception amongst the two strains. Figure 1. Differential expression of TRPV1 in C57BL/6 and BALB/c mice TG neurons.Immunohistochemical staining of trigeminal (TG) sections from C57BL/6 and BALB/c mice using Anti-TRPV1 (VR1) Antibody (#ACC-030). TRPV1 staining (green) is higher in IB4-positive TG neurons from C57BL/6 than BALB/c mouse strains.Adapted from Ono, K. et al. (2015) with permission of American Physiological Society. Nighot, M.P. et al. (2015) PLoS ONE 10, e0138174. This study was focused in studying the effects of CLC-2 knockout in gastric mucosa. Immunohistochemical staining of mouse gastric tissue sections using Anti-CLC-2 (CLCN2) Antibody (#ACL-002) showed that the chloride channel is localized to parietal cells along with H+/K+ ATPase (Figure 1A). The specificity of the antibody was demonstrated in western blot analysis and in immunohistochemical staining (Figures 1B-D) which show lack of immunostaining of the channel in CLC-2 knockout mice. Importantly, the study shows that CLC-2 knockout leads to a significant decrease in gastric acid secretion, parietal cell number and H+/K+ ATPase. Figure 1. Expression of ClC-2 in parietal cells of mouse gastric mucosa.A. Immunohistochemical staining of mouse gastric mucosa using Anti-CLC-2 (CLCN2) Antibody (#ACL-002) (red). Same sections are stained for H+/K+ ATPase (green). Merge panel shows co-localization of the two proteins. B. Western blot analysis of ClC-2 in WT and ClC-2-/- mouse gastric mucosa using Anti-CLC-2 (CLCN2) Antibody shows that antibody is indeed specific for ClC-2. C. Immunohistochemical staining of mouse gastric mucosa shows lack of ClC-2 staining in ClC-2-/- mouse. D. Immunogold electronmicroscopy of ClC-2 in WT and ClC-2-/- mouse gastric parietal cells.Adapted from Nighot, M.P. et al. (2015) PLoS ONE 10, e0138174. with kind permission of Dr. Blikslager, A.T. North Carolina State University, College of Veterinary Medicine, Raleigh, North Carolina, United States of America. Sheng, W.L. et al. (2015) PLoS ONE 10, e0117967. 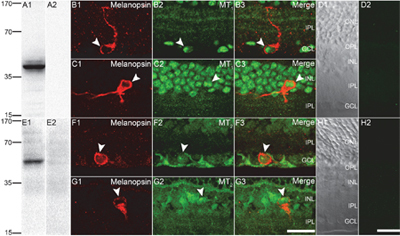 Intrinsically photosensitive retinal ganglion cells (ipRGCs) express melanopsin, a photopigment, and directly signal light. However, the circadian regulation of their activity is not completely understood. Expression of Melatonin receptors, MT1 and MT2 was examined using western blot and immunohistochemistry analyses using Anti-Melatonin Receptor 1A (MTNR1A) Antibody (#AMR-031) and Anti-Melatonin Receptor 1B (MTNR1B) Antibody (#AMR-032). Western blot analysis of rat retinal lysates shows clear bands corresponding to the molecular weight of the respective receptors. In addition, the specificity of the antibodies was demonstrated by preabsorbing the antibody with the control peptide antigen (Figures A1, A2 and E1, E2). The exact identity of the cells expressing the receptors was shown in immunohistochemistry using the same antibodies. The expression of both receptors coincides with that of melanopsin, expressed in ipRGCs (Figures B1 to H2). Expression of Melatonin receptor type 1A (MT1) and Melatonin receptor type 1B (MT2) receptors in rat retina.A1-E2: Western blot analysis: of rat retina lysate:A1. Anti-Melatonin Receptor 1A (MTNR1A) Antibody (#AMR-031).A2. Anti-Melatonin Receptor 1A (MTNR1A) Antibody preincubated with the control peptide antigen. E1. Anti-Melatonin Receptor 1B (MTNR1B) Antibody (#AMR-032). E2. Anti-Melatonin Receptor 1B (MTNR1B) Antibody preincubated with the control peptide antigen. B1-H2: Immunohistochemical staining of rat retina sections using Anti-Melatonin Receptor 1A (MTNR1A) Antibody (#AMR-031) (B2, B3, C2, C3) and Anti-Melatonin Receptor 1B (MTNR1B) Antibody (#AMR-032) (F2, F3, G2, G3). Melatonin receptor expression (green) coincides with that of melanopsin in ipRGCs (red). Note that detection of both receptors is abolished when the antibody is preincubated with the control peptide antigen (panels D2 and H2).Adapted from Sheng, W.L. et al. (2015) with kind permission of Weng, S.J. Institute of Neurobiology, Institutes of Brain Science, State Key Laboratory of Medical Neurobiology and Collaborative Innovation Center for Brain Science, Fudan University, Shanghai, China. Azroyan, A. et al. (2015) PLoS ONE 10, e0121419. 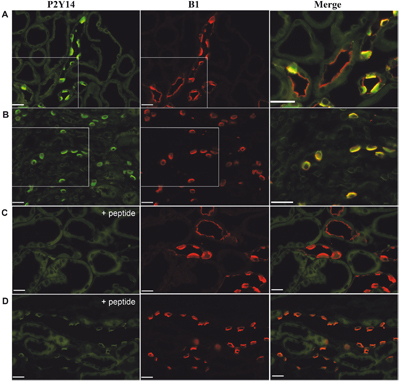 P2Y14 receptor is expressed in kidney collecting duct intercalated cells where it mediates sterile inflammation, a pro-inflammatory response in the absence of infection. Indeed, immunohistochemical staining of mouse kidney sections using Anti-P2Y14 Receptor (extracellular) Antibody (#APR-018) demonstrates that the receptor is exclusively expressed in intercalated cells and co-localizes with V-ATPase B1 subunit expressed in these cells but not in distal tubule cells, which also express V-ATPase B1 (Figure 1). This study identifies a novel pro-inflammatory role for intercalated cells via P2Y14 Receptors. Figure 1. Expression of P2Y14 in mouse kidney.Immunohistochemical staining of mouse kidney sections using Anti-P2Y14 Receptor (extracellular) Antibody (#APR-018). P2Y14 receptor staining (green) is detected in intercalated cells only of the cortex (A) and medulla (B). P2Y14 receptor co-localizes with V-ATPase B1 subunit (red staining) in intercalated cells but not in distal tubule cells. Pre-incubation of the control peptide antigen, abolishes P2Y14 staining in both cortex (C) and medulla (D).Adapted from Azroyan, A. et al. (2015) with kind permission of Dr. Breton, S. of Center for Systems Biology, Massachusetts General Hospital/Harvard Medical School, Boston, Massachusetts, USA. Makarenko, V.V. et al. (2015) Am. J. Physiol. 308, C146. Oxygen levels in the blood are detected by carotid bodies. Voltage-gated Ca2+ channels play an important role in detecting O2 levels. CaV3.2 channel is the major T-type CaV channel expressed in glomus cells, the cells important for sensing O2. 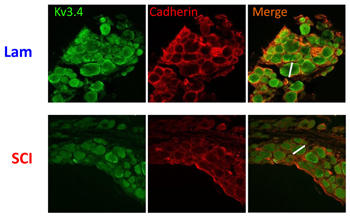 Indeed, RT-PCR and immunohistochemistry of rat carotid body sections using Anti-CaV3.2 (CACNA1H) Antibody (#ACC-025) shows that CaV3.2 (red) is highly expressed in the carotid body. Western blot analysis of rat DRG lysates using the same antibody showed that the Ca2+ channel is also expressed in DRGs. Importantly use of the control peptide antigen completely obliterated the signal obtained with the antibody (Figure 1). In addition, CaV3.2 was found to be involved in mediating the carotid body’s response to hypoxia, an effect inhibited by the application of TTA-A2 (#T-140), a specific T-type Ca2+ channel blocker. Figure 1. Expression of CaV3.2 in rat carotid body.Left: mRNA expression of different CaV channels in the carotid body. Right: Immunohistochemical staining of rat carotid body using Anti-CaV3.2 (CACNA1H) Antibody (#ACC-025). CaV3.2 staining (red) is detected in glomus cells. Use of the control peptide antigen eliminated the signal obtained using the antibody.Adapted from Makarenko, V.V. et al. (2015) with permission of the American physiological society. Yang, Y. et al. (2015) J. Neurosci. 35, 7950. Activation of spinal microglia is common in neuropathic pain induced by nerve injury. However, the role of microglia activation in cancer pain is not clear. In the presented study, inhibition of microglia significantly decreased cancer pain in the advanced phase. Reports suggest that microglial P2X7 receptor is involved in the release of pro-inflammatory cytokines responsible for nociceptive transmission in the spinal cord. Immunohistochemical staining of rat spinal dorsal horn using Anti-P2X7 Antibody (#APR-004) or Anti-P2X7 (extracellular) Antibody (#APR-008) shows that P2X7 co-localizes with CD11b, a microglia marker (Figure 1A upper two panels) and not with NeuN, a neuronal marker. 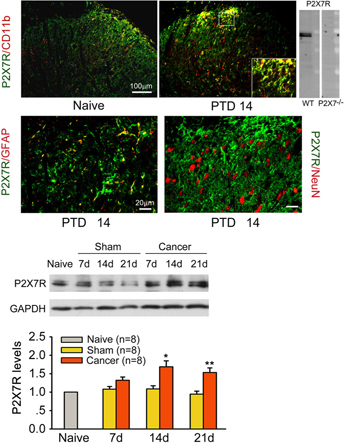 In addition, P2X7 expression is significantly up-regulated on post-tumor day 14 (PTD 14) (Figure 1B). The specificity of the antibody was demonstrated on P2X7 knock-out mice (western blot in Figure 1A). Figure 1. 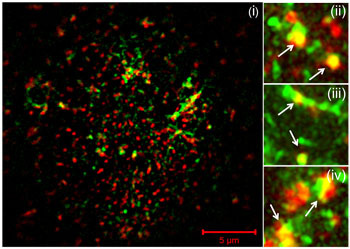 Expression and upregulation of microglial P2X7 receptor in cancer.A. Immunohistochemical staining of of rat spinal dorsal horn using Anti-P2X7 Antibody (#APR-004) or Anti-P2X7 (extracellular) Antibody (#APR-008) shows that P2X7 co-localizes with CD11b, a microglia marker (two panels) and not with NeuN, a neuronal marker (lower right panel). Specificity of the antibody was tested on P2X7 knock-out mice (western blot, in upper panel). B. Western blot analysis of rat dorsal horn lysates shows that P2X7 expression increases on post-tumor day 14 (PTD 14).Adapted from Yang, Y. et al. (2015) with permission of the Society for Neuroscience. TRPV4 channel functional expression is downregulated as a result of diabetes complication and leads to loss of vision. Immunohistochemical staining of rat retinal sections using Anti-TRPV4 Antibody (#ACC-034) shows that the channel is mostly expressed in the endothelium of retinal microvessels (Figure 1A). Sections from diabetic animals show a decrease of about 70% in TRPV4 expression when compared to normal sections (Figure 1C). The specificity of the antibody was demonstrated using the control antigen (Figure 1B). Overall, the study raises TRPV4 function as a possible target in diabetic retinopathy. Figure 1. Downregulation of TRPV4 in rat retinal microvascular endothelium.Immunohistochemical staining of rat retinal sections using Anti-TRPV4 Antibody (#ACC-034). A. TRPV4 expression (green) is mostly detected in the endothelium of retinal microvessels. B. Specificity of the antibody is depicted by showing loss of TRPV4 staining when pre-incubating with the control peptide antigen. C. Significant decrease in TRPV4 expression is observed in retina section from diabetic animals.Adapted from Monaghan, K. et al. (2015) with kind permission of Curtis, T.M., Centre for Experimental Medicine, Queen’s University of Belfast. Zhang, C. et al. (2015) Am. J. Physiol. 308, F1288. Kir4.1 channel was found to be expressed in the cortical thick ascending limb (cTAL). Immunohistochemical staining of mouse kidney sections using Anti-Kir4.1 (KCNJ10) Antibody (#APC-035) showed that the channel is expressed in the basolateral membrane of cTAL (Figure 1). However, knockout of the channel did not lead to any significant outcomes. Figure 1. Expression of Kir4.1 in mouse kidney sections.Immunohistochemical staining of mouse kidney sections using Anti-Kir4.1 (KCNJ10) Antibody (#APC-035). Kir4.1 expression (red) is detected in the basolateral membrane of the cortical thick ascending limb.Adapted from Zhang, C. et al. (2015) with permission of the American Physiologycal Society. Tao, X. et al. (2015) Am. J. Physiol. 308, H707. 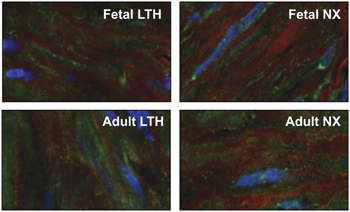 Long term hypoxia (LTH) was found to increase Ca2+ affinity of BK Channels in cerebral artery smooth muscle of both adult and fetal ovine. Electrophysiological experiments indeed showed that BK channels are significantly more active under LTH. However, immunohistochemical staining of BK channels in ovine arteriole myocytes using Anti-KCNMA1 (KCa1.1) (extracellular) Antibody (#APC-151) shows that the α subunit is equally expressed among the different groups (Figure 1). Figure 1. Expression of KCa1.1 in adult and fetal ovine arteriole myocytes.Immunohistochemical staining of adult and fetal ovine arteriole myocytes using Anti-KCNMA1 (KCa1.1) (extracellular) Antibody (#APC-151). KCa1.1 staining (green) is detected similarly whether under normal conditions (right panels) or under hypoxia (left panels).Adapted from Tao, X. et al. (2015) with permission of the American Physiological Society. Elgueta, C. et al. (2015) J. Neurosci. 35, 4131. 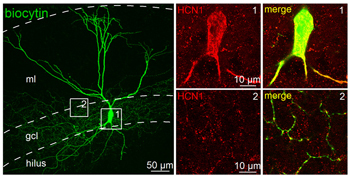 HCN channels were found to be important for the persistent firing of the perisoma-inhibiting interneurons in the dentate gyrus. These types of firings occur during conditions of intense activation of the network. Anti-HCN1 Antibody (#APC-056) detected HCN1 expression in parvalbumin-expressing perisoma-inhibiting interneurons (Figure 1). Figure 1. Expression of HCN1 in perisoma-inhibiting interneurons (PIIs) of the dentate gyrus.Immunocytochemical staining of perisoma-inhibiting interneurons using Anti-HCN1 Antibody (#APC-056). HCN1 expression (green) is detected in the soma and axon colaterals. Biocytin was used to label neurons.Adapted from Elgueta, C. et al. (2015) with permission of the Society for Neuroscience. Radwanski, P.B. et al. (2015) Cardiovasc. Res. 106, 143. Some forms of cardiac arrhythmias may be a result of diastolic Ca2+ release form the sarcoplasmic reticulum. Patients suffering from this type of arrhythmia respond in many cases to NaV channel blockers. Immunocytochemical staining of mouse isolated myocytes using Alomone Labs Anti-SCN1A (NaV1.1) Antibody (#ASC-001), Anti-NaV1.5 (SCN5A) (1978-2016) Antibody (#ASC-013) and Anti-NaV1.6 (SCN8A) Antibody (#ASC-009) antibodies shows that all three neuronal NaV channels co-localize with Ryanodine receptor 2, a marker of the sarcoplasmic reticulum (Figure 1). Together with electrophysiological studies, the data sheds light on the mechanism regarding Ca2+ release and arrhythmias. Figure 1. Immuno-colocalization of neuronal NaV channels and Ryanodine receptor 2 in mouse cardiomyocytes.Immunocytochemical staining of mouse cardiomyocytes using Anti-SCN1A (NaV1.1) Antibody (#ASC-001), Anti-NaV1.5 (SCN5A) (1978-2016) Antibody (#ASC-013) and Anti-NaV1.6 (SCN8A) Antibody (#ASC-009) antibodies. All three neuronal NaV channels (green) co-localize with Ryanodine receptor 2.Adapted from Radwanski, P.B. et al. (2015) with permission of the European Society of Cardiology. Lorin, C. et al. (2015) Cardiovasc. Res. 106, 153. Duchenne muscular dystrophy (DMD) is caused by a lack in functional dystrophin, leading to the degeneration of skeletal muscle, cardiac failure and arrhythmias. At the molecular level, the lack of dystrophin expression causes the malfunction of stretch-activated channels, leading in turn to increased stress-induced Ca2+ influx. TRPV2 channel was found to be involved in the increase in Ca2+ influx observed in cardiomyocytes isolated from the mouse model system for DMD. In diseased mice, immunocytochemical staining of cardiomyocytes using Alomone Labs Anti-TRPV2 (VRL1) (extracellular) Antibody (#ACC-039) showed that TRPV2 is translocated to the sarcolemma and is prominent along the T-tubules (Figure 1). In addition, blocking the channel using Anti-TRPV2 (VRL1) (extracellular) Antibody protected the cells from stress-induced abnormal Ca2+ signals. Figure 1. Expression of TRPV2 in mouse cardiomyocytes.Immunocytochemical staining of mouse cardiomyocytes. Staining of cells using Anti-TRPV2 (VRL1) (extracellular) Antibody (#ACC-039) (green), shows that TRPV2 is translocated to the sarcolemma along the T-tubules in cardiomyocytes from DMD mice (lower left panel).Adapted from Lorin, C. et al. (2015) with permission of European Society of Cardiology. Morales-Cano, D. et al. (2015) Cardiovasc. Res. 106, 98. 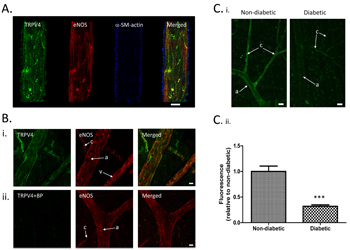 The role of KCNQ (KV7) channels in vasodilation by hypoxia and the effect of diabetes on their expression and activity were investigated. Electrophysiological recordings of left coronary arteries (LCA) versus right coronary arteries (RCA) showed that LCAs were more sensitive to KV7 blockers and activators. Indeed, immunocytochemical staining of rat smooth muscle cells from LCA and RCA using Anti-KCNQ1 Antibody (#APC-022) and Anti-KCNQ5 Antibody (#APC-155) showed that the expression of both channels is higher in LCA than in RCA (Figure 1). The physiological consequences of the differential expression of KV7 channels is also apparent under hypoxia and high glucose, which both show a decrease in LCA expression and an impairment of KV7 channels in LCA but not in RCA. Figure 1. Expression of KCNQ1 (KV7.1) and KCNQ5 (KV7.5) in rat smooth muscle cells.Immunocytochemical staining of rat smooth muscle cells from LCA and RCA using Anti-KCNQ1 Antibody (#APC-022) and Anti-KCNQ5 Antibody (#APC-155) shows that the expression of both channels is higher in LCA than in RCA.Adapted from Morales-Cano, D. et al. (2015) with permission of the European Society of Cardiology. Ritter, D.M. et al. (2015) J. Neurosci. 35, 1260. Dysregulation of KV3.4 channel was found to be involved in spinal cord injury (SCI) patients. Inactivation of KV3.4 channels expressed in DRGs causes DRG neurons to enter a hyperexcitable state. Western blot analysis of rat DRG lysates using Anti-KCNC4 (KV3.4) Antibody (#APC-019) showed no significant changes in KV3.4 protein levels from control and SCI rats. However, immunohistochemical staining of rat DRGs showed that cell surface expression of KV3.4 decreased following SCI (Figure 1). 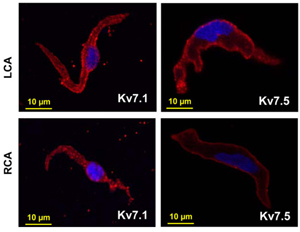 This work identifies KV3.4 as a potential therapeutic target following SCI. Figure 1. Decrease in KV3.4 cell surface expression following SCI.Immunohistochemical staining of rat dorsal root ganglion following laminectomy (upper panels) and spinal cord injury (SCI) (lower panels) using Anti-KCNC4 (KV3.4) Antibody (#APC-019). KV3.4 surface expression (green) decreases following SCI as opposed to laminectomy.Adaped from Ritter, D.M. et al. (2015) with permission of the Society for Neuroscience.